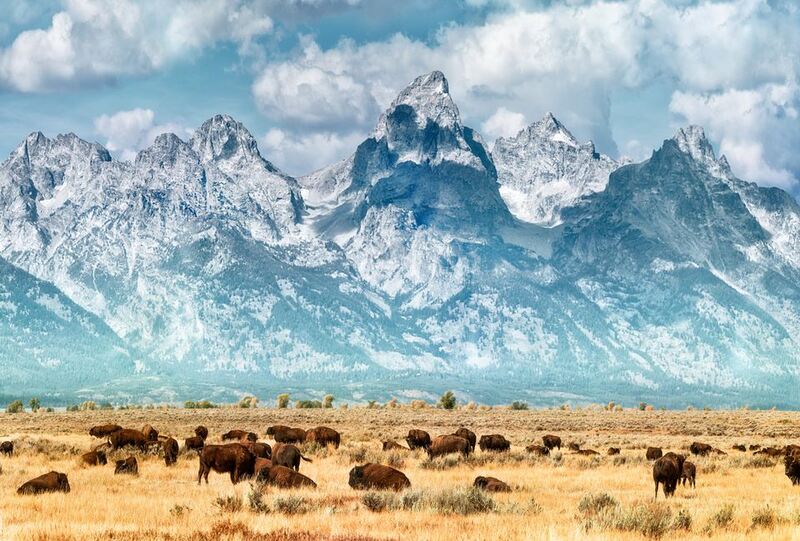 The state of Wyoming is rich in natural wonders and Old West history. With famous National Parks, towering mountain peaks, wild rivers, and wide-open plains, this state draws visitors and recreationists from around the world. The history of the West—from the Native American and cowboy heritage to the development of the railroads and mining—can be experienced at historical sites, museums, and visitor centers, and also by wandering around preserved downtown districts. Yellowstone National Park is truly one of the world's most natural wonders. The 2.2 million acres that make up the park—96 percent of which is located in Wyoming—boast jaw-dropping geysers, colorful hot springs, majestic mountain ranges, and vibrant rivers and waterfalls. The most popular attractions include Old Faithful Geyser, Mammoth Hot Springs, and the Grand Canyon of the Yellowstone River. But, adventurous folks can wander into the backcountry to avoid both the traffic and crowds and catch a glimpse of wildlife, including wolves, elk, bison, and bears. Grand Teton National Park is home to postcard-perfect scenery that rivals something you'd see in Europe or Patagonia, Chile. Rugged peaks, rushing rivers, serene lakes, and wildflower-filled meadows offer much solace for a city-dwelling visitor. Similar to neighboring Yellowstone, park wildlife ranges from large bison, elk, and bears to small mammals like pika and marmots. The National Park, the nearby Bridger-Teton National Forest, and the resort town of Jackson Hole combine to make one vast outdoor playground that offers something for every season. Whitewater rafting, hiking, horseback riding, fishing, lake cruises, snowshoeing, and skiing are just some of the seemingly endless engagements. With a 4,139-foot vertical drop and 2500 acres of in-bounds skiing terrain, Jackson Hole Mountain Resort rivals any resort in the world for the ultimate skiing experience. However, since 50 percent of the terrain is suitable for experts only, this isn't the place to go to get your bearings. Even still, the lower mountain offers beginner terrain and the mountain school provides superior lessons, should you need to sharpen your skills. Head to the base in Teton Village for gourmet restaurants, four- and five-star accommodations, and a hopping nightlife. The Buffalo Bill Center of the West consists of five terrific museums, each worth a visit on its own. Experience a slice of American history by viewing artifacts from the life of Buffalo Bill Cody at the Buffalo Bill Museum. The Cody Firearms Museum features a huge collection of firearms from around the world. If flora and fauna is your thing, don't pass up the Draper Museum of Natural History's wildlife and geology exhibits. The Plains Indian Museum offers exhibits and a multimedia show depicting the true heritage of regional Native Americans. And a world-class collection of Western art—with works by Charles Russell, Frederic Remington, and WHD Koerner—can be found at the Whitney Gallery of Western Art. There's a lot to learn at the National Historic Trails Interpretive Center in Casper, Wyoming. During your visit, you'll wind your way through galleries featuring Wyoming's first inhabitants, mountain men, and fur trappers. See the routes of the Oregon Trail, the Mormon Trail, the California Trail, and the Pony Express and discover the journey settlers took along the way. History comes alive in the center's multimedia presentation, living history demonstrations, guided hike, and special events. Held annually since 1919, the Cheyenne Frontier Days Rodeo is known as the "Daddy of 'em All" due to both the quality and the quantity of its rodeo action. The late-July festivities include ten days of rodeo, concerts featuring national country-music acts, a carnival, a horse-filled Grand Parade, an Indian Village, complete with traditional dance and costumes, and a western art show. If you can't make to Cheyenne in July, wander into the Cheyenne Frontier Days Old West Museum to get a taste of the rodeo experience. Fort Laramie once was a fur-trading post in 1834, then the site went on to serve folks migrating west via the Oregon and California Trails. The Fort Laramie National Historic Site includes a number of restored historic buildings that you can explore by booking a walking tour. While there, stop at the visitor center and enjoy an 18-minute history video, a bookstore, and a museum. Museum exhibits include uniforms, weapons, and artifacts from Fort Laramie's colorful history. Wyoming's most popular state park offers a year-round treat for visitors. The site of the world's largest mineral hot spring, the area draws not only human tourists, but is also home to Wyoming's central bison herd. Visitors can enjoy a soak in the 104-degree mineral waters indoors at the State Bath House, or in two outdoor pools. If you're there in the summer, take in the interesting rock formations created by mineral waters by hiking their extensive trail system. The park's famous flower garden is a site to see, as well. Off the beaten track in northeast Wyoming lies a stately rock formation made famous by the movie "Close Encounters of the Third Kind." Today, this tower is the focal point of Devils Tower National Monument and worshiped by nationwide rock climbers. Tower Trail, a 1.3-mile paved trail, circles the tower and can be enjoyed via a guided hike. Before you leave, check out the visitor center to learn about the natural history of Devils Tower and its surroundings. Then, take your turn at rock climbing the tower (if it's within your skill level) or marvel at the climbers who flock to this rock. This 20-mile loop offers you a remarkable glimpse of Wyoming's history. Follow the path of those who traveled cross-country via the Oregon Trail, the California Trail, the Pony Express, the transcontinental railroad, and the Lincoln Highway. Stop along the way at the Fort Bridger State Historic Site, complete with a museum and a walking tour of the old fort and restored historic buildings. This original trading post, founded by Jim Bridger, was taken over in 1853 by the Mormons when they sent militia to arrest Bridger for selling alcohol to the Indians.